Yesterday morning I woke up and knew I wanted to have some eggs for breakfast. When I opened my fridge I noticed a bunch of vegetables that were sitting around from various dinners throughout my week and I decided to get a little creative and use up what I had. Little did I know just how ridiculously delicious this would be. I wasn’t planning on sharing this recipe but when I had a bite I stopped eating and immediately grabbed my camera so all of you could make this too. 1) Start to boil the water so you can poach your eggs. I poach mine one at a time because I use the whirlpool method and I’m not savvy enough to double up yet. You can use your preferred method of poaching but if you need help, this video is fab. 2) While your water is warming up, start on your veggies. Melt the butter in a saute pan over medium-high heat. When the butter is completely melted, add the onion and saute until they are translucent. 3) Next add your asparagus along with a pinch of salt and some flower pepper. Remember it’s important to season your dish each time you add something new so you create flavor! 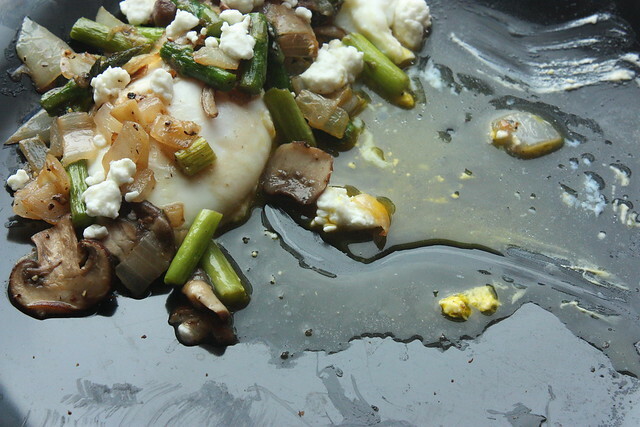 While the asparagus and onion and sauteing, poach your first egg. 4) When your first egg is finished, start poaching your second egg. 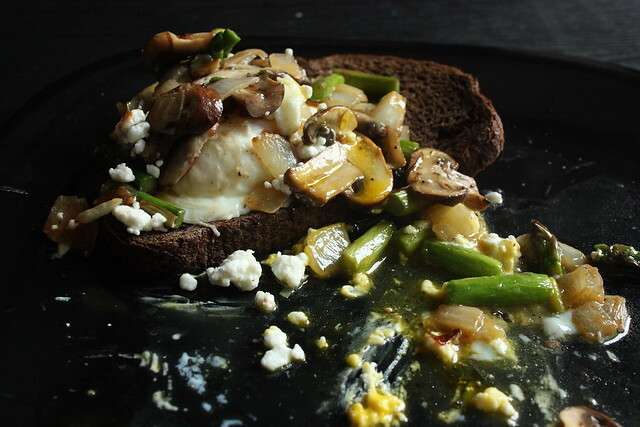 While the second egg poaches, pop your toast in the toaster and add the mushrooms to the asparagus and onion pan. Remember to add another pinch of salt and flower pepper! 5) When your mushrooms are browned and your asparagus is softened and your onions are smelling wonderful you’re all set to go. Turn off the heat, lay your pieces of toast on a plate and put one poached egg on each piece. Top with your veggies and add in some crumbled goat cheese to top it all off. I’m not kidding when I say I literally scraped the extra veggies straight out of the pan into my mouth. This dish is PERFECT for springtime and would be really easy to multiply if you’re feeding a large group. It looks and tastes so elegant (thanks to the goat cheese and fresh veggies) but is so easy to make. Enjoy this one, kids :).